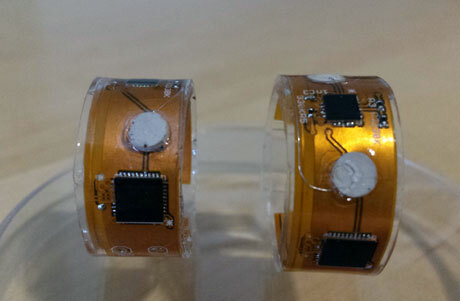 Prototype of wearable finger ring with electrocardiograph (ECG) sensor. Zhenyu Li dreams of a day when sudden cardiac events, such as heart attacks, will be more quickly detected using a wearable finger ring with an electrocardiograph (ECG) sensor. Li, an assistant professor in GW’s School of Engineering and Applied Science (SEAS), Dept. of Biomedical Engineering, has recently been awarded a Commonwealth Research Commercialization Fund (CRCF) grant by Gov. Terry McAuliffe. His $100,000 matching grant is one of 38 awards totaling more than $2.8 million, which fund targeted areas of promising research and commercialization, including advanced manufacturing, cybersecurity and energy and life sciences. 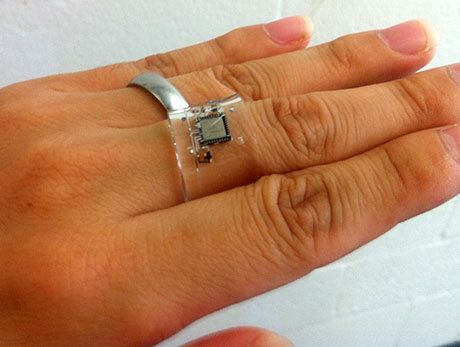 Li’s research grant, “A Wireless Wearable Electrocardiogram (ECG) Sensor on a Finger Ring,” will be used to develop a prototype of a finger-ring shaped wearable ECG sensor at GW’s Virginia Science & Technology Campus. It will be made using a unique bendable and stretchable electronics technology already patented by GW. Li, the principal investigator, is an expert on soft lithography, microfluidics and biosensors and the lead inventor of the US patent on which this work is based. GW plans to commercialize the finger ring in partnership with Zansors LLC, a Tysons Corner, Virginia-based company. 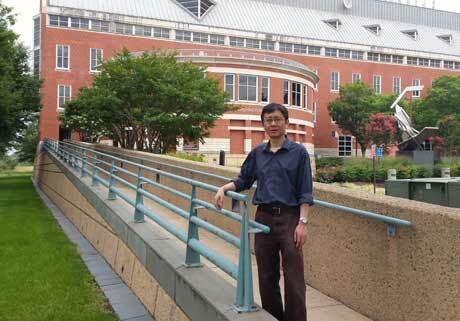 Zhenyu Li pictured in front of Exploration Hall at GW's Virginia Science and Technology Campus. During the one year grant period, which started July 1, 2015, he will work with his doctoral student, Quan Dong, to design, manufacture and test the proposed ECG sensor. The research team will also include support from two of GW’s senior faculty members. Mona Zaghloul, professor of Electrical and Computer Engineering at GW, an expert on CMOS electronics and MEMS and sensors, will guide the design of sensor front end electronics, microcontroller and BLE. Can Korman, professor of Electrical and Computer Engineering and associate dean at GW’s School of Engineering, will provide theoretical support on the design and analysis of the sensor, electronics and testing. The proposed technology addresses significant unmet market need. Cardiovascular disease is the leading cause of deaths in the United States. The key to saving patients suffering from sudden cardiac events is early diagnosis. Current ECG monitoring is a $4 billion dollar market, but no current products can provide on-demand multi-lead ECG signals over long periods (>2 weeks). Patients currently have two options for monitoring. 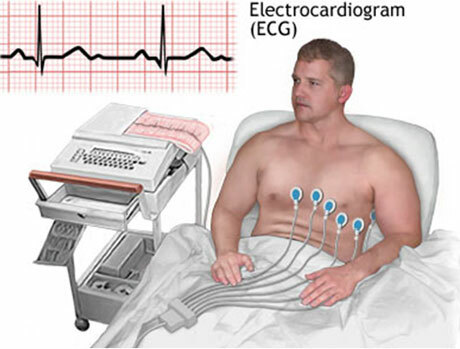 One, be hooked up to a bulky 12-lead ECG machine, which is not practical for long-term monitoring. Two, use other existing ECG wearable sensors that have more portability, but they only provide a single-lead ECG measurement, which is inadequate for heart attack diagnosis. GW’s technology is unique because it can be worn long-term while providing multi-lead ECG signals for event diagnosis. Users will activate on-demand data collection by touching the ring to a different location on the body. The ECG signals can be sent wirelessly to a smartphone for display and analysis, or a remote authorized physician for diagnosis and fast intervention. Prof. Li and the rest of the research team have significant work ahead this year to build and test the prototype, but the device shows great promise for commercialization. The technology used in the wearable ECG sensor on a finger ring can also be adapted to other vital signs, such as blood oxygenation, body temperature, respiration and potentially blood pressure. It can be of great value to monitor health issues, especially for people with chronic diseases.